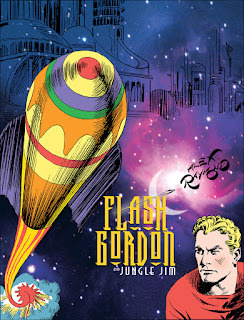 Last week, I talked about the original Flash Gordon comic strip and where it could be found in print. The last incarnation of the series is at Dynamite Entertainment. Dynamite produced a limited series in 2011 with designs by Alex Ross, then relaunched again with a limited series in 2014 written by Jeff Parker and drawn by Evan "Doc" Shaner. This series is available as an omnibus edition. The basics are familiar to readers of the old strips and comics or viewers of the movie, cartoon, or serials. Flash, Dale, And Zarkov head to Mongo to save the Earth. Here Flash is a bit of an extreme sports enthusiast and son of a wealth. (If your keeping track, Flash as been a polo star, Olympic decathlon athlete, pro football player, and pro basketball player in previous incarnations). Parker characterizes him as personable, overconfident, and perhaps not terribly bright. It works pretty well. Dale has the biggest role she's probably had in any version, but that largely makes her into a no nonsense reporter a la Lois Lane, and straight man for Flash's antics. Zarkov is not totally unlike the 80s movie version, though perhaps with a hint of Tony Stark. 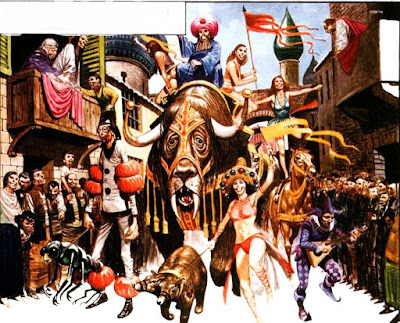 The various lands of the 30s Mongo, are now different worlds, having been conquered by Mingo via gates of some sort, one of which opened on Earth. The designs for various cultures seem a synthesis of the comic strip and the 80s film. Overall, the series keeps the verve of the original version of the property, while updating it to a modern context. I'm not fond of all the choices they made, but in general it is well done. Dynamite had a 2015 series as well, which may well be a follow-up to the Parker/Shaner series, though neither of those creators were involved. After the z-bombs dropped in the Great War, civilization on the planet Zarthoon was cast into ruin. Only the small continent of Azot, not the home of any of the super-power blocs, had any cities left intact. These became the city-states of the modern era. The only domed city-state, Azmaron is ruled by triune Zodaracy*. 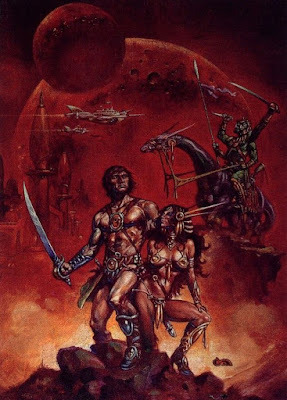 All Azmaronians encountered outside their city are women, indeed no men have every been seen within the city itself by visitors, though the Azmaronians tightly restrict the movement of foreigners. There are persistent rumors that the Azmaronians retain a functional doomsday device of former age, but Azmaron is silent on this point. They do possess greater technological knowledge than their neighbors. Ptaarna is a city of tall spires built atop a large mesa in the midst of Azot's central desert. The city is only accessible from the air. The city maintains an impressive fleet of fliers, though mostly they are smaller in size. It's pilots are known as daredevils. The city sponsors a race every year through the desert, and it's pilot's typically take home the Uldran Prize. Ptaarna's sky gardens are considered one of the modern wonders of Zarthoom, but they are not merely decorative. Many rare medicinals derived from their bounty. The people of Zinjaro enjoy a life of leisure to a degree not afforded other city-states. This is the happy result of still-functional food and manufacturing automation in the ruins beneath the city. The Zinjaro work in service or entertainment occupations, and the city is very hospitable to visitors, at least in part because they hire from among these visitors to fill their armed forces and some administrated functions. Their zodak (largely a ceremonial post) is even of foreign derivation. All is not idyllic in Zinjaro, however. It's people are something stricken by a fits of violent madness known as plak omok. This is at least somewhat contagious among the Zinjar, and so one case emerging can lead to widespread outbreak of mayhem. Visitors should beware. *Zodak/Zodara: the Zarthoonian word for ruler. I mentioned the impending release of What Ho, Frog Demons! the fourth of Chris Kutalik's Hill Cantons adventure supplements Friday, not knowing it was so close at hand. Surprise! It's now available on drivethru/rpgnow. 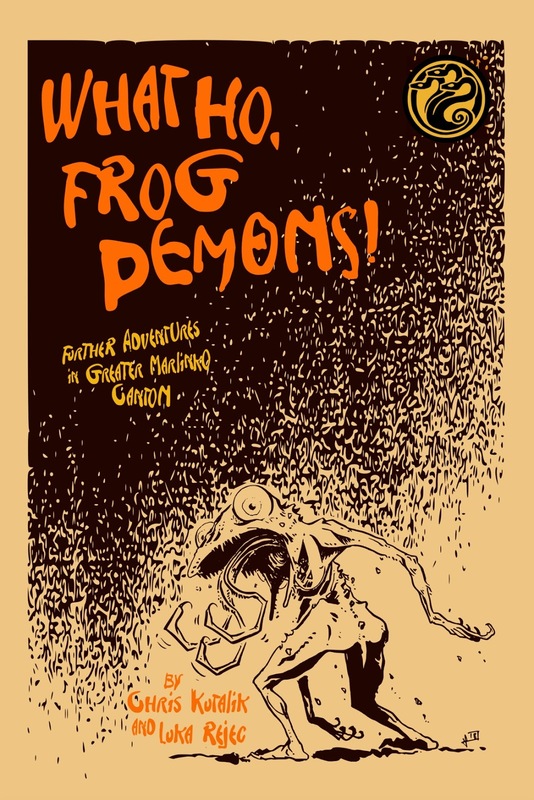 What Ho has two shorter adventure sites, an overview of Marlinko Canton where this and the other publications have take place, and supporting tools like random village and frog demon generators. The text is written in Chris's engaging style, festooned with humor sometimes Vancian, sometimes old school D&Dish. 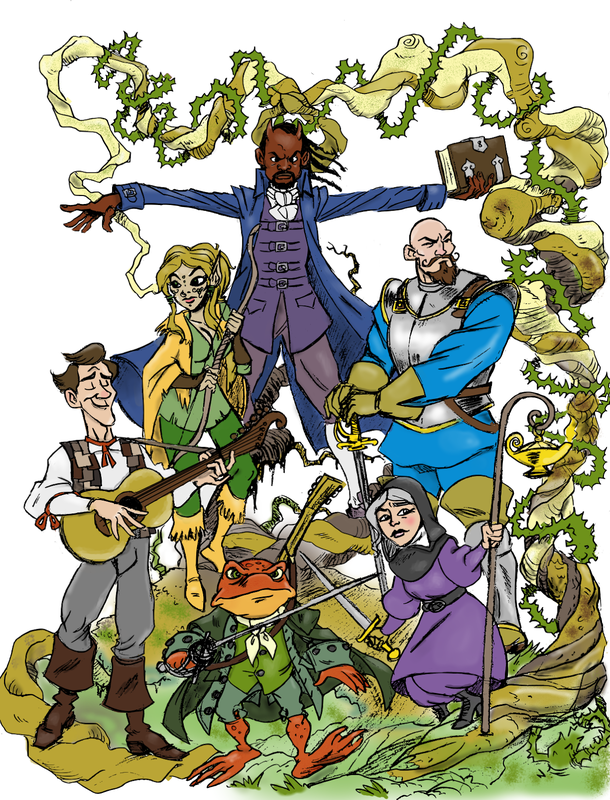 (It isn't comedy, however, so if your D&D is a more somber affair, it's easy to disregard.) The art by Luka Rejec flows from illustratorly to cartoony and back again. It encompasses everything from pieces that look like sketches from life to anachronistc near one panel comics. Whatever it's style, it is always interesting and well done. Maps are in the flavorful style of Karl Stjernberg, and I designed the cover in reference to German Expressionist movie posters, but it also kind of resembles the work of Ralph Steadman with Luka's wild-eyed illustration ensconced. So I did some small work on the project and it came out from a co-op of which I am a partner, so my bias is there for all to see. Still, I think I can honestly say this a flavorful work that could only possibly have come from the DIY Gaming seen, but it is not meant to merely be the subject of gaming "shelfies," sitting with uncrack'd spine among other luminaries of the OSR Pantheon. It's meant to be played and enjoyed. It's Friday and it's a good time for some shameless Hydra Cooperative plugging. For no particular reason, I'm going to adopt a Marvel Comics Bullpen Bulletins style for that--but not alliterative nicknames. ITEM! The hardest working man in Hydra, Luka Rejec, has released Witchburner just in time for your Halloween adventuring. 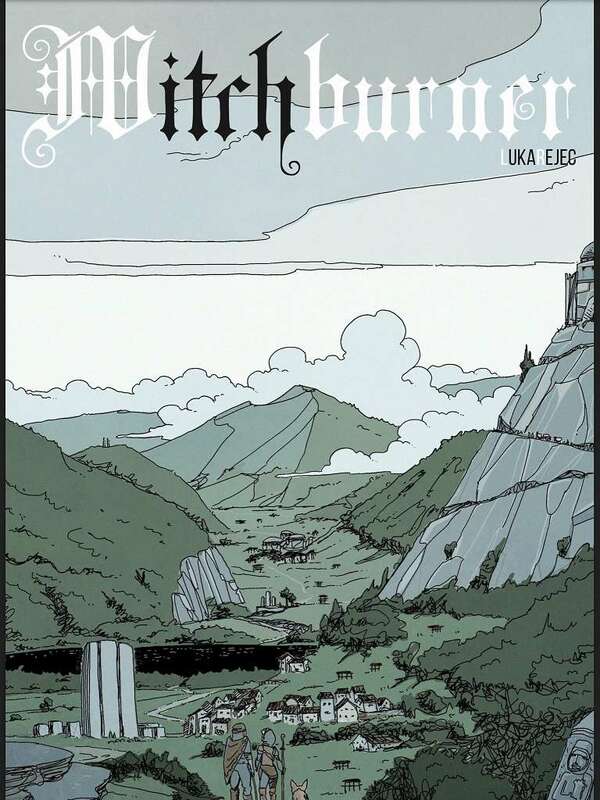 Luka says: "an intimate, tragic adventure of witch hunting in a town huddled between rivers and mountains and forests one wet and cold October." So there you go. Witchburner is available in a free burner edition and in the full edition for a very reasonable price. ITEM! The long wait is nearly over for the Hill Cantons faithful! 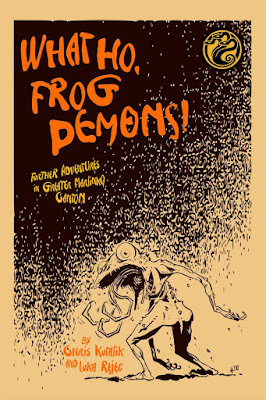 Chris Kutalik's What Ho, Frog Demons! is being released to Kickstarter backers and soon to every one else. It features art by the aforementioned dynamo Luka Rejec and maps by Karl Stjernberg. It will be on the holiday gift list of every geek in the know, so make sure you can show your superiority by getting your copy first! 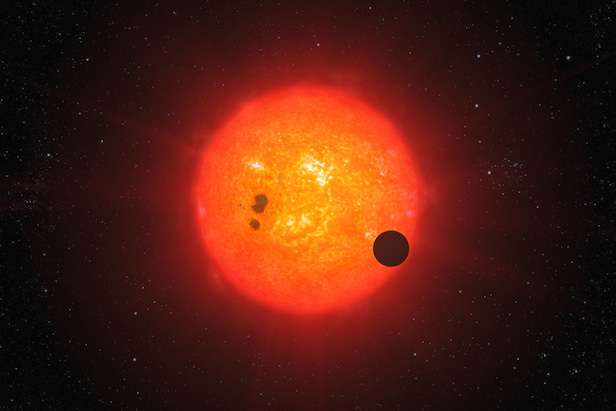 It is a planet orbiting a G-type star, 66 G. Centauri, some 30 light-years from Earth. It is about one and a half times larger than Earth, but is less dense, so it has a similar gravity. It has one moon, but also a glittering band of dust, where perhaps another moon once orbited. Some people of Earth have come to Zarthoon in the past, by mysterious means. Indeed, the primary intelligent species seems to identical to Terran humanity in all respects. There was a nuclear war centuries ago. Zarthoon's advanced civilization was mostly destroyed, only ruins remain of once advanced cities on most continents, though there are a few cities, including the domed city of Azmaron, which hold on to a bit of their former glory. In most places it is a "points of light" setting where city-states are isolated and surrounded by monster and mutant-infested wilderness. Much of Zarthoonian technology is based around the radioactive mineral called zuranite. Its radiation is focused to provide beam weapons of deadly force, used to power the buckler-like hand-shields that are the only protection against those beams, and to power the anti-gravity engines of fliers. Most disputes aren't settled with zuranite ray guns, but instead with swords, graceful rapiers edged with crystalline adamant so that no metal armor can resist them. Not everyone has access to fliers and so many rely on beasts of burden, including the swift, flightless avian zurch, and the beaked and elephantine vastidars. It's great to come back from out of town and have new art to show off. 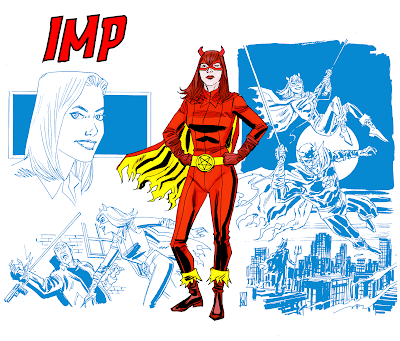 Here's Libby Knight aka Imp, the Teen Devil, by Dean Kotz. 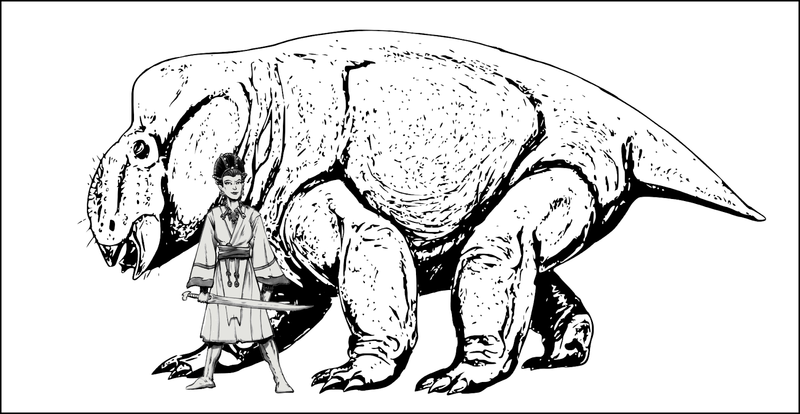 After way more intensive review of Barsoomian names in Edgar Rice Burroughs Mars books and adding a dash of Gardner Fox's Llarn novels, which pretty closely mimic Barsoomian morphology, I have come up with a series of generators for Martian names, as accurate as I can make it. Well, there's one name from the series it can't generate, but by the time I discovered this, it was too late. Anyway, it's pretty close to getting them all. Check it out. Note the in the structures given for the names multiple "elements" typical mean a new word for males names, but is more likely to be a multi-syllabic "single" name for females, but since this isn't always the case I've elected to leave the dividing up to you. For example: EES is the structure of Djor Kantos, but also Carthoris and Vanuma. 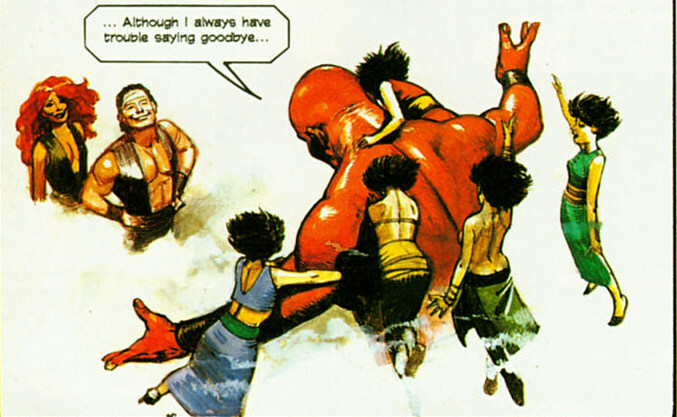 Flash Gordon first appeared in the Sunday Comics section and was born of King Features Syndicate's desire to compete with Buck Rogers--and only after they had failed to acquire the rights to John Carter of Mars. Alex Raymond is given credit for its creation, though he was partnered with the (uncredited) writer/editor Don Moore. Until recently Alex Raymond's original run was not fully available in reprint, to say nothing of the work various artists that came after him. 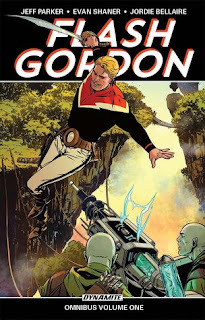 Titan Books has been working on their "Complete Flash Gordon Library" and has the most comprehensive reprint series so far (well, at least since Kitchen Sinks' in the 90s) with Austin Briggs, Mac Raboy, and Dan Barry represented, but they are reproduced at a smaller size than the original strips. For you purists, IDW has a solution, at least for the Alex Raymond years. 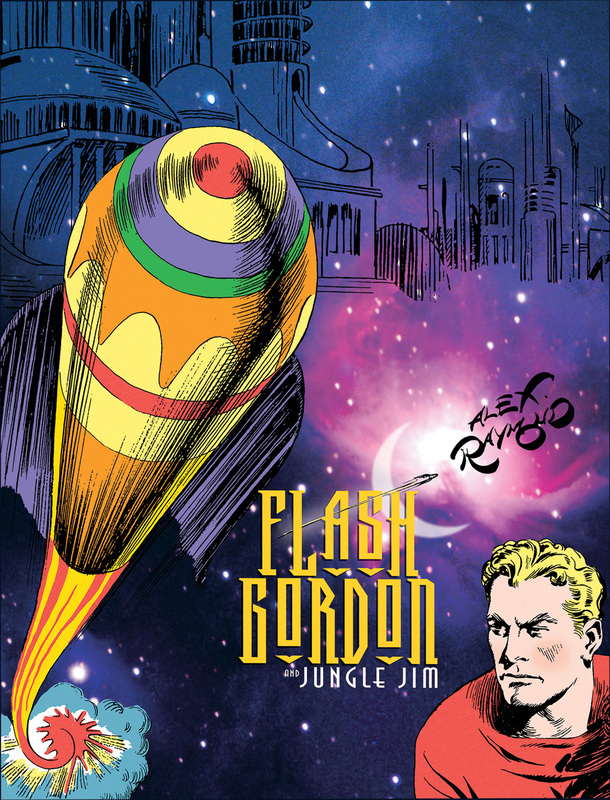 Their four Definitive Flash Gordon and Jungle Jim volumes carry you through Raymond's entire 1934-1943 run, and the first storyline by Austin Briggs to end up in 1947. The real draw, though, is that they are reproduced slightly larger than original print size. (Some pedantry might come in regarding sizes and definitiveness. Earlier reproductions of only Flash Gordon split the full pages into landscape pages, so they are not smaller than IDW's, but this comes at the sacrifice of faithfully reprinting the page.) IDW also included the paper dolls that occasional ran with the original strip. I wrote a post last week that was a follow-up to a previous posts where I outlined a few mysteries that had come up in our new 4 years-old Land of Azurth campaign. Anne of DIY & Dragons asked if I had in thoughts to share regarding who these mysteries developed and the development of this sort of stuff in general. I should say this campaign is not an open sandbox. 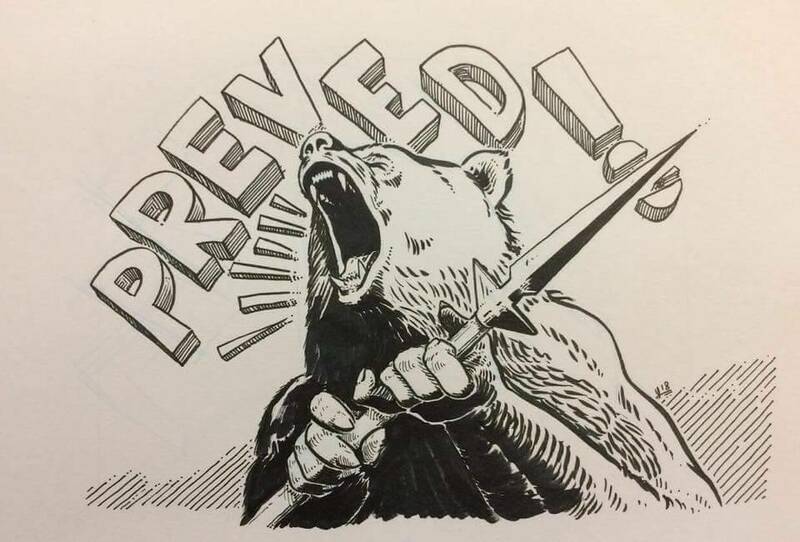 Most adventures come about by me as the DM laying out the particularly setting and situation, and the PC's confronting the problems as presented, or reframing the problem as something else and confronting that. The applicability of what I say here will of course vary based on how you run your campaign and the degree you care about such things, obviously. Embed mysteries. I constructed the bones of the Land of Azurth setting to have some deep mysteries. I hinted at these but didn't strongly telegraph them, or push them on the players. 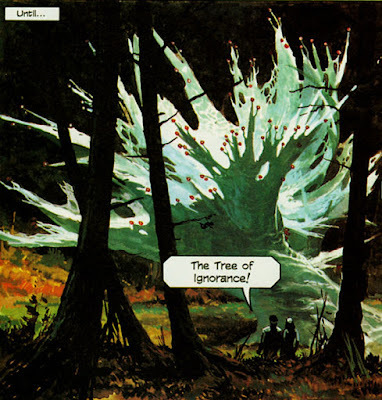 They are to this day, not aware of most of them--though they have brushed against them once or twice, and are interested in things that connect to them. You have to be patient, but if you want the player's interested in the mysterious background of your setting it has to be there. Don't make it all up. Some people feel like the fixed details of the setting are necessary for player's to make maximum meaningful choices about their actions. I advocate a more of a tv series looseness as I've discussed before. So, if one of my initial ideas was "the World Emperor is mad!" or whatever, but as I'm dropping hints to this, the PCs become convinced the "World Emperor is possessed!" well, you know, maybe he could be? Also, you have to leave room for the players' to become interested in things you hadn't thought of yet, and no need to waste all your good adventure seeds on fallow ground. Recurrent NPCs with their own agendas. 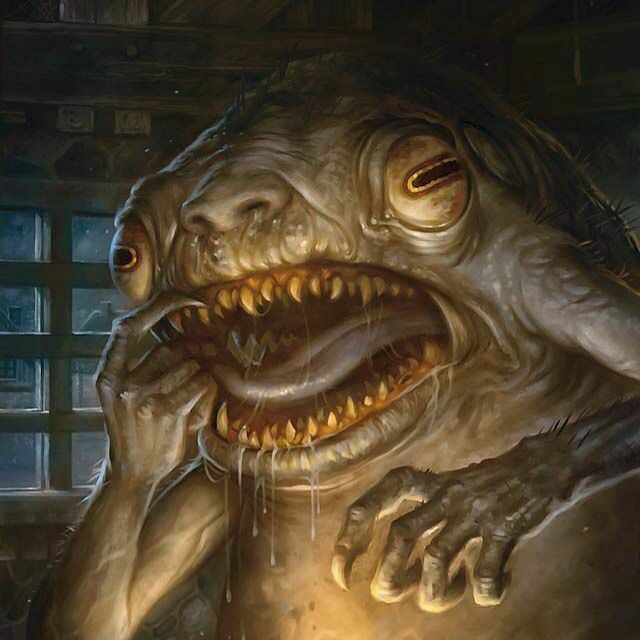 My players are suspicious that Viola, the Clockwork Princess of Yanth Country, despite most appearances as a benevolent monarch, may have a sinister agenda. What made them suspicious? Well, the Princess's somewhat callous behavior and general "need to know attitude," and conspiratorial musings of a pirate queen they once interacted with. These things would never have mattered if the PCs hadn't had frequently and suggestive interactions with the Princess for them to start wondering about her. Treasures with a story. Magic items and treasure serves a utilitarian purpose, but it shouldn't just be --or even mostly--be that. In prepping for the session, I substituted the Book of Doors for a spell book in the original run of Mortzengersturm, and added a portal to 19th Century Earth in Mort's chamber. That has gotten at least one player very interested in portals and incursions from or too other worlds, and given me further references to drop in later adventures. The Projector to the Etheric Zone was another adventure seed lying in wait for the player's to take interest. And potentially valuable mysteries tend to get their interest first! Work with the Players' creation. Most of my players came up with a little backstory at creation. 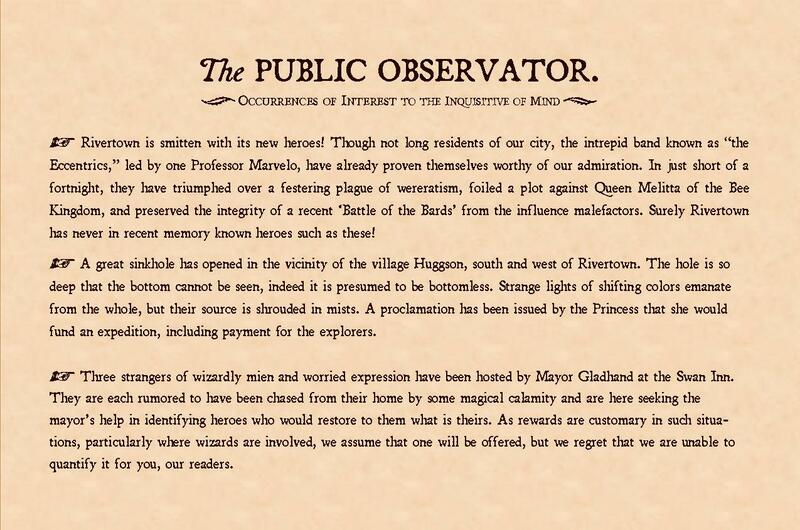 No multi-page epics, but a paragraph or so, based on the map and campaign intro materials I gave them. Plus, I had asked them all at the outset, "Why are you in Rivertown?" Jim's bard, Kully, for instance had come looking for his missing father. He had initially told me a talking calico cougar had told him to seek his father in Rivertown. 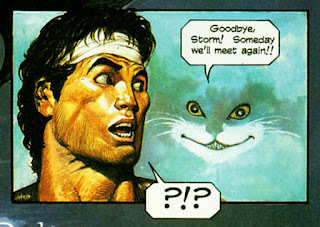 I suggested maybe it was a Calico Cat Man, and Jim agreed. Now, part of the setting intro was that their were no cat folk in Azurth. So, now we had a mystery--and a coincidental name connection to the mysterious crime lord I had already named. Then of course, there was the recent return of Kully's father to set off the recent adventure. So that's it. Or, at least that's all I can think of at the moment. It's been gratifying to run a campaign where the players aren't just interested in the adventures, but in the world behind them. Arno Kaltmann was born from a eugenics experiment by the German Thule Society. His parents were selected for their “pure Aryan” heredity, and in the womb, he was exposed to chemicals synthesized from instructions found in a manuscript discovered in the Antarctic in what was believed to be one of the last outposts of the Hyperborean civilization. From birth, Kaltmann exhibited an unusually low body temperature and an aversion to warmth. He was raised in a special cold room, which suited his metabolism, but kept him isolated. When the Thule Society disbanded, the Nazi government took over care of the young Kaltmann. Hitler viewed him as embodying a rediscovery of the pure Hyperborean ancestry of the Aryan peoples. The Nazi leadership wanted a army of genetic Hyperborean soldiers, but the Allied forces defeated them before their plans could be realized. Kaltmann was captured by the U.S. military and moved to a secret facility in Greenland. There he was studied with the goal of replicating his resistance to the cold. A secret prisoner of war, he was kept in a containment cell and given no contact with the outside world. When Kaltmann was in his early twenties, he took advantage of the guards’ distraction and escaped, killing a particularly callous military scientist as he went. He yearned for revenge against the Americans who had mistreated him and robbed him of the destiny he was promised as the forerunner of a master race. He escaped into the Arctic, where he believed his enemies could not easily follow. There, he was discovered by a hidden offshoot of humanity known as the Abhumans. Some of the Abhuman community worshipped the extinct Hyperboreans, and recognizing Kaltmann’s link to them, hailed him as a messiah of sorts. Opportunists used the cult to overthrow the Abhuman royal family and install Kaltmann, with the idea that he would be their puppet. 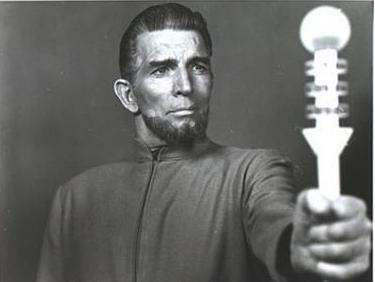 Kaltmann carried little for ruling the Abhuman city, but saw the Abhumans as allies in his plan for revenge against the United States. To this end, Kaltmann had a cryosuit and cold projectors built by Abhuman engineers. As the Frozen Führer, he and his lackeys attempted to gain control of an ICBM silo in North Dakota. He planned to start a nuclear war to bring about “Fimbulwinter” and a new Ice Age, but his scheme was foiled by Thunderhawk and the female motorcyclist troubleshooters known as the Avenging Angels. Though defeated, Frozen Führer was not deterred and as clashed with various heroes in his attempts to start a new, cold Reich. 1. Who is the man in the metal suit beneath Castle Machina? 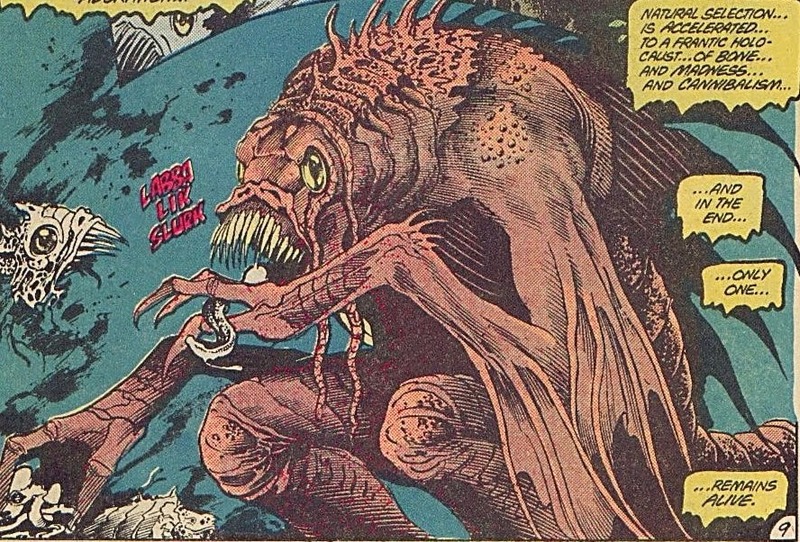 The name "Lum" was thrown around, and Mirabilis Lum is said to have disappeared beneath the castle, but is the man in the metal suit him, who was he gaming with, and why does he stay down there? Updated. The party still doesn't know, but perhaps more information has come to light since, with the mention of a man named Loom living in a distant junk city. 2. What does Calico Bonny look like? The Queen of the Floating World of Rivertown tends to hide behind a folding screen if she bothers appearing at all. Is there a reason? Solved. Calico Bonny is a member of the so rare as to be believed mythical Cat Folk. The party has met her brother. 3. Who were the builders of the Cloud Castle? The scale of the castle indicates they most have been near giants, though the ancient images suggest they looked something like the Cloud People that live there now. Who were these people with a flare for Googie architecture and mid-Century design and what happened to them? Still unknown. This hasn't really come up again. Maybe someday. 4. What does the projector do? The Princess Viola says it can open a portal to another world once it is fixed, but what world? And who built it? Solved. The device turned out to be for opening portals into the Etheric Zone. The party went there and was tricked into releasing the Super-Wizard criminal Zuren-Ar from the cosmic prison known as the Carnelian Hypercube. The repercussions of this act have yet to be experienced. 5. Where does the magic portal in Mortzengersturm's mansion lead? 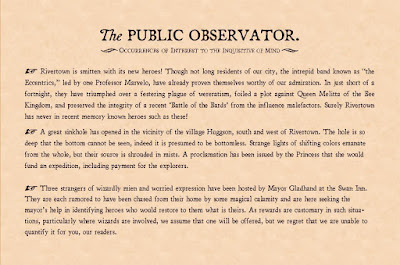 The frox thief Waylon saw an image of another world: people in unusual clothes in an impressive city, beyond the technology of the Land of Azurth. Where (or when) was this place and why did Mortzengersturm have a portal to it? Partially solved. The portal was actually a page from the Book of Doors. A book of magical portals that keeps popping up. Mars is dying and has been for millennia. The only truly fertile land left in the squarish Land of Oz, surrounded on all side by the deadly desert. Oz has four countries, each home to a different race of men. The east is the home of the Blue Men, sort in stature and friendly. It was once ruled by an ancient crone, but she was dispatched by a little girl from Earth. In the South is the Country of the Red Men, ruled by a benevolent queen. In the west are the Yellow Men, who are renowned for their technological skill. They are ruled by a metal man. The northern country is the land of the Purple Men. 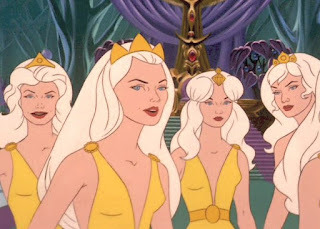 They have been ruled by a succession of queens with a mastery of powers of the mind. In the center of Oz is the Emerald City-State, made entirely of crystal. Its true color is not one human (or Martian eyes) may see, but the people wear optics which convert the color to green. It was formerly ruled by a man of Earth, a charlatan and huckster, but the rightful queen has been restored, who had spent her young life disguised as a boy. Young Dorothy Gale was transported to Mars by a strange storm that through her and her house and dog across the astral void. She killed a which, exposed a charlatan, and helped restore the rightful ruler of Oz. She didn't do it alone. She was aided by a Lion Man, exiled for his supposed cowardice, a an artificial man without the ancient brain that formerly guided him, and a Yellow Man who's mind was placed in a metal body. They took the ancient Golden Road that followed the canals that flowed from the hum of the great Emerald City, then undertook a quest to depose the witch that ruled the Yellow Men and forced them to use their knowledge to build an army for war. This was only the first on many trips Dorothy Gale made to Mars. A younger farm girl became an dying world's greatest hero. Storm realizes the scissors are also hand for cutting the fruit from the tree. He gets two of the red spheres, which seem to hold the nightmares at bay. The make it back to the pillar of light. Storm throws in the fruit--the egg of Pandarve--and it is cast forth from the center of the planet into the atmosphere-filled space. There it forms the seed for accretion of a new world. Our 5e Land of Azurth game continued last night. After hearing the party's story, the lovely Randa decides to take them to her father, the wizard Phosphoro, who she is sure will help them, though he tends to disintegrate most visitors. They travel the the innermost sphere of the sanctum to meet him. To their surprise, the stern and imperious wizard does offer to remove the curse of wandering laid on them by the Sea King, point them in direction of Under Sea, and allow them to keep the magic items they have stolen, but they must do something for him in return. He wants a particular page from the Book of Doors (which they took from Mortzengersturm). After some debate, the party agrees to give him the page he wants, but Phosphoro explains he cannot take the page now, because he can't identify it. He needs them to bring him the page from the future. 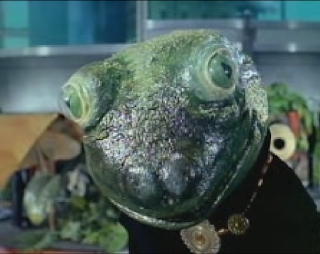 He also suggests that there Kully can get his wish to find out more about Princess Viola. Not really understanding how this will work, the party nevertheless agrees since Phosphoro is allowing them to complete their quest to Under Sea first. With his magic staff, Phosphoro transports them back to the submarine and sets them on the path. Within hours they descend into the depths, then come up in Under Sea, which is a land of a lazy river and Spanish moss in live oaks, that happens to have the shimmering sea forming a dome above it. 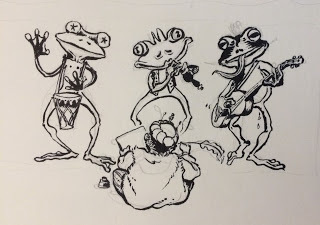 The one frogling town in Under Sea is now under the thumb of the Toads and their Toad temple, which just appeared one day in a blinding flash. Frogling are taken to the temple for sacrifice. Old Freedy, the ambassador, goes off to find out when the next sacrifice is likely to be, while the party hides out to formulate a plan. Shade and Waylon do some invisible scouting and see a toad priest and some acolytes going to a tavern. They seem less like toad people and more like people in toad masks. Before they can investigate further, Old Freedy comear tearing down street chased by an actual toad monster than seems to move in shadows. They manage to pull Freedy into an alley and try to trick the creature with an illusion, but it doesn't work. Somehow, the thing moves through the shadows to end up behind them and uses its toxic tongue to yank Waylon into its mouth. Shade puts several arrows in the monster, but it only lets a near death Waylon go when Freedy escapes. They return to the stable where the the party is hiding out. The monster attacks there too, somehow mystically tracking Freedy. Pummelled by spell and arrow, the thing eventually disolves into goo and a wispy shadow, but only after Kairon shrank it too small to swallow anyone. "All was born from us and to us it will return"
"I am what remains of Kolb...and more"
Ed Kolb was a petroleum engineer for Hexxon Oil tasked with exploring a pocket deep underground where a substance, dubbed the "Black Mass," with unusual properties had been discovered. Upon breaching the chamber, Kolb and his team found that the Black Mass was a vast pool of protoplasm with an alien intelligence. Telepathically communicating with them, the entity asserted that it was the oldest living thing on earth, and all other lifeforms were ultimately derived from its substance. With its pseudopods, the Black Mass absorbed the others, but left Kolb with part of his intellect intact and animated his partially consumed corpse within his environmental suit, so it could use him to explore the outside world. 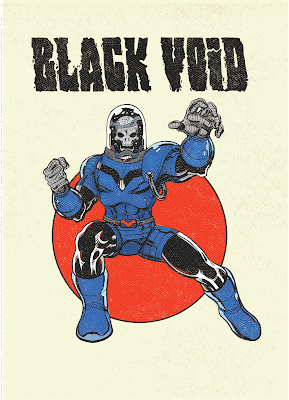 The Kolb-Black Mass hybrid soon came in contact with Subterraneans, whose civilization had long been aware of the entity they called the Black Void and had sought to contain it. The prince of the underground civilization, the Sub-Terran (see Sub-Terran), battled this new manifestation of the Black Void and forced him back into the chamber where the Black Mass resided then resealed it. Later, agents of Hexxon released the Black Void and brought him to Hexxon’s board of directors, who were all be members of a secret cult that worshiped the Black Mass and sought to use it to gain power. Black Void killed most of the board members and for a time took secret control of Hexxon. See Black Void's FASERIP stats here. 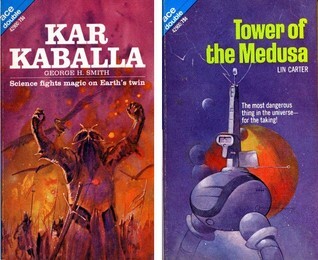 Currently, I'm alternating my reading time between two pulp science fiction novels from the 1960s: Lin Carter's Tower of the Medusa and Gardner Fox's Warrior of Llarn. 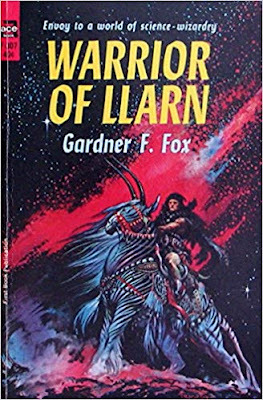 Neither writer is hailed for their great literary accomplishments, though Gardner Fox made substantial contributions to Silver Age comic book history. Both write in a style that harkens back to the days of the actual pulp magazines (which, in Fox's case is where he got his start) and whatever their deficiencies can occasionally turn out a serviceable yarn. Carter has a flare for world-building, if occasionally done in too formulaic and always pretty derivative sort of way. 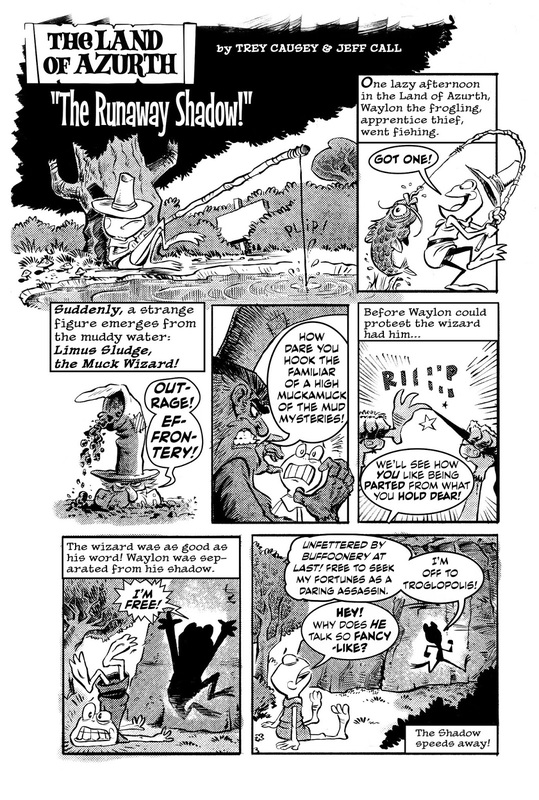 He has a "genius" of combining subgenres that no one had put together before: His Lemuria stories, for instance are basically Conan in a Edgar Rice Burroughs yarn. His Gondwane tales are a faux Vancian mix Oz, Flash Gordon, and the Dying Earth. Tower of Medusa here feels a bit like a C.L. Moore riff in conception: In a future interstellar civilization where less of old knowledge makes ancient tech seem as magic (or maybe it was a fusion of the two?) a tough guy thief and his side kick are coerced into a difficult job: the theft of a jewel called Heart of Kom Yazoth. 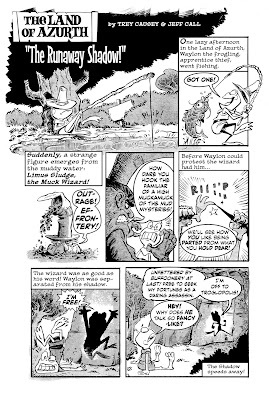 The story reads more like Moore's husband Henry Kuttner in his early pulp stuff. It has none of Moore's atmosphere. Still, it's an above average Carter effort, I feel like. 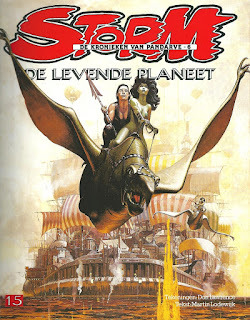 Warrior of Llarn is a Sword & Planet yarn. 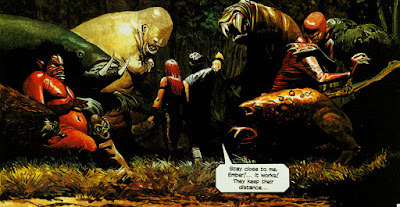 Earthman Alan Morgan gets transport to a distant world by means as yet mysterious. He saves a princess and gets involved with a war between two civilizations. The level of technology of the world is a bit higher than Barsoom, and Fox provides a Dune-esque (a year before Dune) explanation for why people with energy weapons might still use swords. 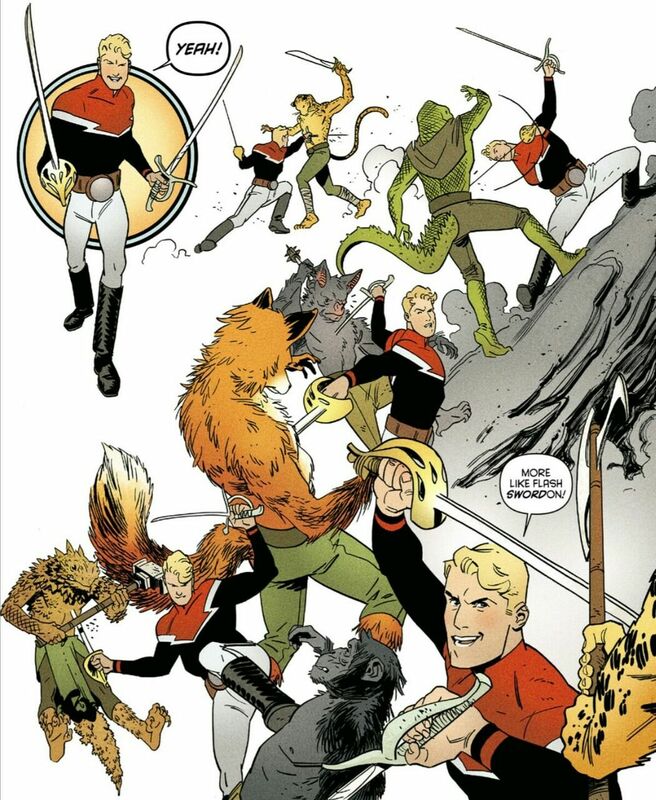 Like Fox's earlier Adam Strange stories for DC, the planet has suffered a nuclear war in the past, which is the cause of it's strange creatures and current lower level of civilization. Fox's story is old fashion, even quaint in many ways, but he's accomplished at delivering the goods. It is not boring. Still ruminating on my Dark Sun riff, I figure first things first: that dark sun. Smith and Vance provide the prototype. As the Smith writes in the "Dark Eidolon": "...the sun no longer shone with the whiteness of its prime, but was dim and tarnished as if with a vapor of blood." Not that it needs to be even vaguely scientific, but the usual way people give this a scientific veneer is to have the Sun (or whatever star) have turned red giant in old age. 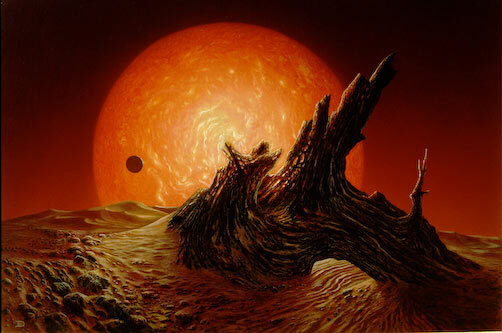 In our solar system, current theory suggests the Earth will have been scorched by the Sun's increasing luminosity billions of years before it goes red giant and consumes the planet entirely, but again fantasy. Also, even a red giant star burns white hot, so would hardly be "tarnished as if with a vapor of blood," but that's seldom concerned sci-fi writers, and shouldn't unduly concern us. Another option, rather than the very luminous red giant, is the small, dark, and cooler red dwarf star. It is true that our Sun (or any star) won't become a red dwarf as it's dying--in fact red dwarfs are very long lived--but hey magic or sufficiently advanced science, right? A red dwarf wouldn't typically look red in the sky either, but it's light diffused through dust or clouds would definitely be more orangish, at least, and it would be dim enough that you could look at it and see flares and things on it's surface. Dim enough, and close enough, because the habitable zone of a red dwarf would be very close to the star, so an Earth like world would be huddled in like a person around a campfire on a cold night. The thing about being so close to the star as that it would likely mean the world was tidally locked; It might well present the same face to the star at all times and have a dayside and a nightside. This could then be a world with a scorching day time desert and a freezing night time desert, but it also offers other possibilities. Of course, the planet could have a 3:2 resonance like Mercury, rather than a 1:1 tidal lock like the Moon, too. So doing a little bit of calculation, and a little bit of making stuff up, here's what I came up with: An world tidally locked to a dwarf star. It's day side is a scorching desert, dotted with dead cities and desiccated sea basins from before whatever happened happened. On the day side over the equator, the sun would be white and a little over 3 times as large as the Sun is in our sky. Further from the equator and the prime meridian (not as arbitrarily placed on a world where the sun doesn't move) the sun is lower in the sky and redder in color. Moving toward the night side, the land would become a little less dry by stages until you reached the terminator (no, not that one) where there would be forest and jungle cloaked in eternal twilight and wracked by fierce storms caused by the meeting of the hot air from dayside and the cold air of the nightside. Here be monsters. Most of the night side, lit only by the stars, is a cold ocean. As we all know places of eternal night are havens of undead, and so must it be here. 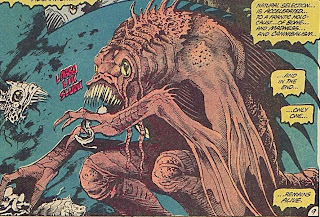 And of course, sea monsters. TwoMorrows just released a new retrospective on the creator of Warlord, Sable, and so many others, titled Mike Grell: Life Is Drawing Without An Eraser. 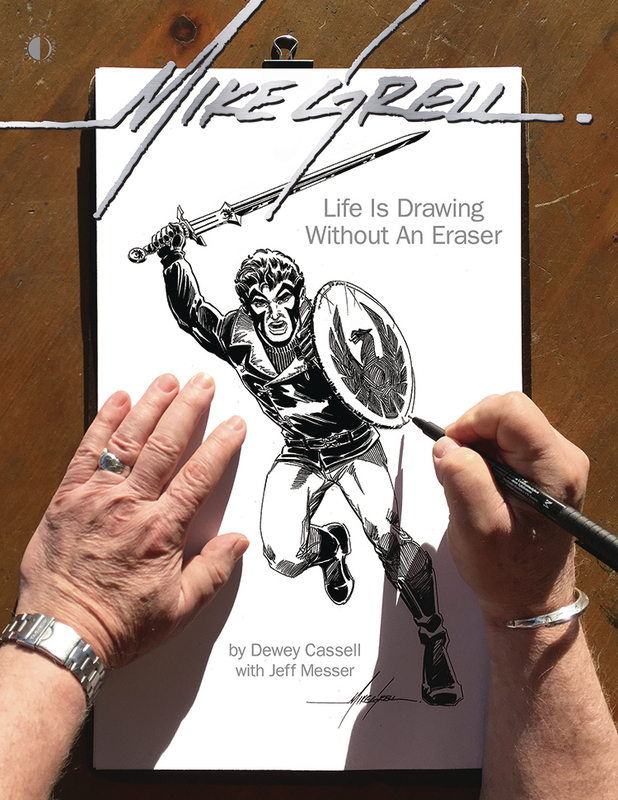 The hardcover clocks in at 178 pages (full color) and is of course full of Grell art from his start on Brenda Starr, through his work for the Big Two and creator owned work. There are chapters on all of his major works (the Legion, Warlord, Sable, Green Arrow, Shaman's Tears, and Starslayer) and own his work on the Tarzan newspaper strip and James Bond graphic novels. Interspersed are mostly reprint but still interesting interviews with Grell or collaborators. 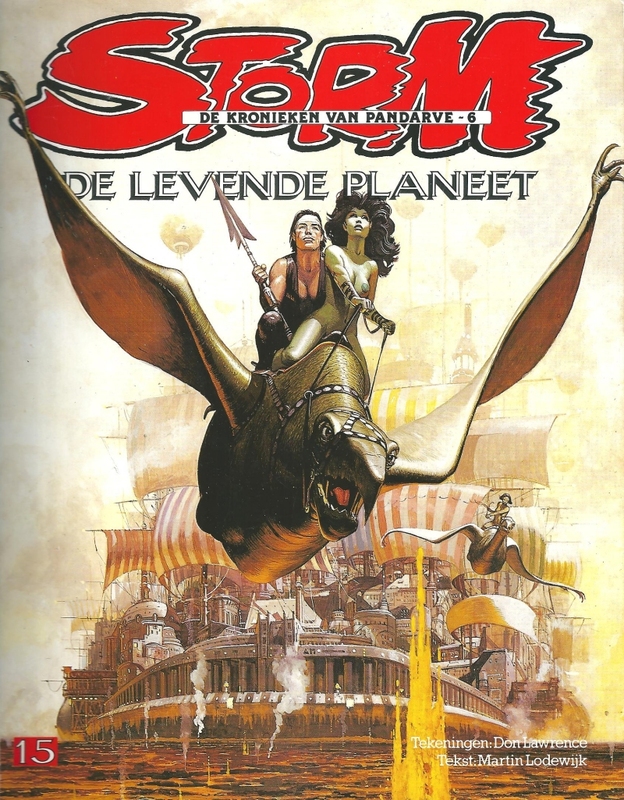 There's also a checklist of Grell's work in comics. The hardcover has an additional gallery section in the back that the paperback lacks. 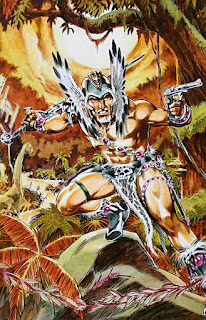 This has several more Warlord images. This post first appeared in December 2012. I have sorted wanted to use these guys in the Land of Azurth, but haven't done so yet. There is, they say, a wandering, cloud island, that is home to clowns. These are no mere performers but the thing the mummers ape, fey and changeable beings not of this world. Where the cloud island passes in it's maundering way, the clowns come down among normal folk, dropping from the sky under motley umbrellas, or sliding down shafts of light. They put on carnivals, perform farces, and throw out candies. After they have gone, people are sometimes found missing, particularly children. Sometimes when the island passes, the clowns don't come down but instead drop candies of preternatural flavors and small items imbued with magic: a hand mirror, a short sword, a jar of skin cream, a pack of gum. There are rumors that these come in trade--or are perhaps stolen--from the Moon. There are tales spun of daring thieves sneaking on to the cloud island to rob the clowns' treasure stores, but as far as is known, these are just stories. Other tales purport to come from people who have visited the cloud island and returned. These seldom mention treasure stores, but do describe colorful tents scattered among cyclopean stone ruins (that may predate the clowns) and the rare tree, strewn with mists and carnival lights. 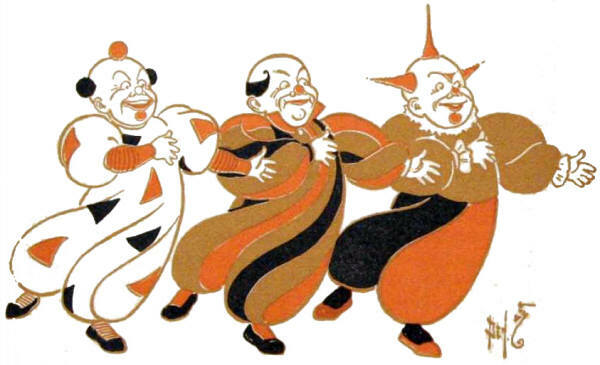 The anarchic clowns careen between merriment and slumber. No clown ever seems to die, no matter what sort of violence is done to them. Sometimes, for reasons unknown, a clown falls from the island. These strange,sad creatures become wandering tramps, losing much of their magic and too often turning drink.